Place chopped apples in small bowl and sprinkle with 2 tbsp of white sugar and 2 tsp of cinnamon. Stir until coated and set aside. In a medium bowl whisk together 4 eggs, vanilla creamer, sweet potato puree, brown sugar, vanilla extract, 2 tsp cinnamon, and nutmeg until well blended. Grease the inside of a 4 quart slow cooker. Add a layer of 1/2 bread cubes. Sprinkle with 1 cup of chopped apple mixture. Sprinkle with 1/2 cup chopped California Walnuts. Pour 1/2 of the egg mixture over the layers. Repeat layers with remaining bread cubes, apples and California walnuts. Pour remaining egg mixture over the layers. Gently toss to make sure all bread cubes are fully coated with egg mixture. Cook on low 3 to 4 hours until knife inserted in middle comes out clean. 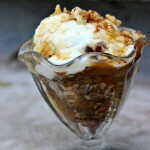 Serve warm with caramel syrup, additional California walnuts, and frozen yogurt if desired.